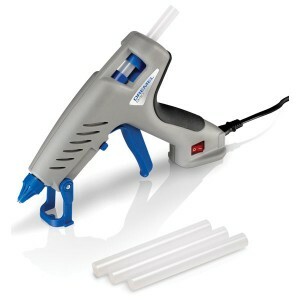 Dremel 940 Glue Gun : The Dremel 940 is a high temperature (195 °C) glue gun with a drip-controlled exchangeable tip. 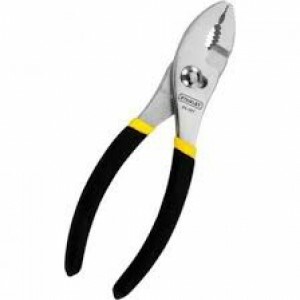 With its removable cord the 940 can be used at any place without available power. 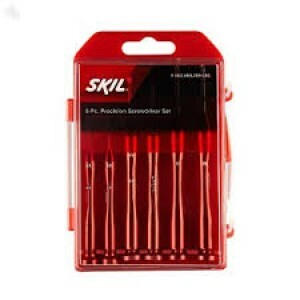 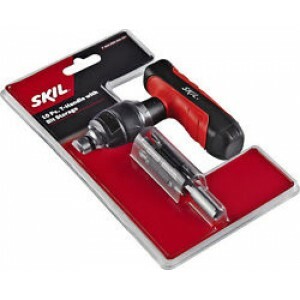 Because of its good ergonomics (on/off switch, T..
Skil 10pcs T-Handle Screwdriver with Bit StorageFeatures :Includes T-Handle Driver, 85mm Extension Bar, (4) Phillips Bits: PH0, PH1, PH2 (x2), PH3, and (3) Slotted Bits: 1/4-in, 5/32-in, 3/16-in Comfortable grip for easy use Handle doubles as st..
Skil 28pcs T-Handle Screwdriver SetFeatures :Includes T-Handle Driver, 85mm Extension Bar, (4) Phillips Bits : PH0, PH1, PH2 (x2), PH3, and (3) Slotted Bits : 1/4-in, 5/32-in, 3/16-in Comfortable grip for easy use Handle doubles as storage space.. 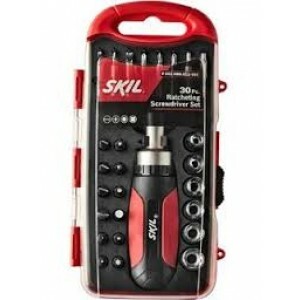 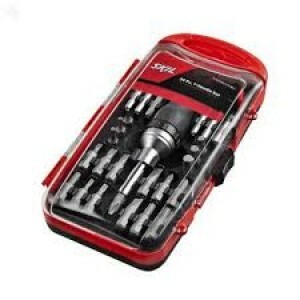 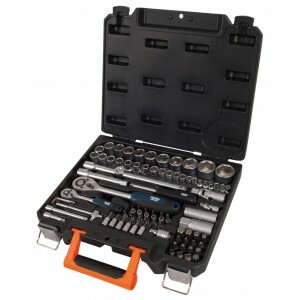 Features 28 piece mini ratcheting T-handle grip for increased torque and comfort Reversible shaft holds both precision and standard bits Convenient hard storage case Includes: &nbs..
Skil 6pcs Foldable Screwdriver with carabinder keychainDescription :Handy light and pocket-friendly this six-piece screwdriver set is well-designed and value for money.The small screwdriver set has regular bits two precision bits and hex keys.The pro.. 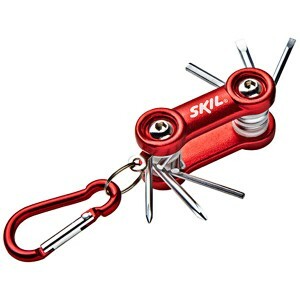 Suitable for precision work at office and household For opening small screws Color: Red Material: Stainless steel ..
Skil Stubby Screwdriver - Slotted Features : Soft Grip Slotted Screw driver tip (non-magnetic) Ideal for DIY Application , open screw heads and where a shorter length is required Specifications : Screw drive.. 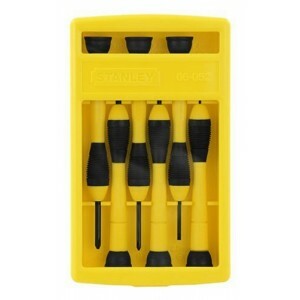 The Stanley 66-039 6-Piece Jewelers Precision Screwdriver Set features swivel-head handles which provide precision and reach. 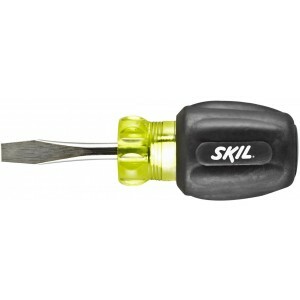 Bright, plated shafts are fluted for a steady, solid grip. 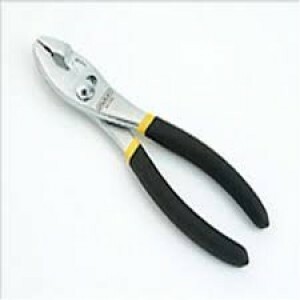 Hardened and tempered steel blades with blued finish to resist c.. 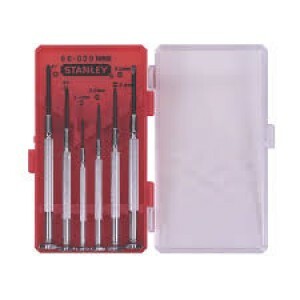 The Stanley Precision Screwdriver Set provides you with 6 of the most popular Phillips and slotted screwdrivers for a wide range of fastening applications. 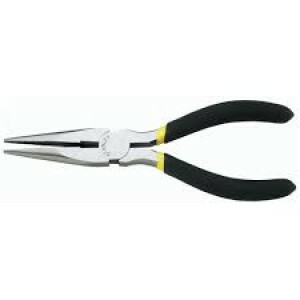 These six precision screwdrivers feature swivel-head handles to provide precision and reach, ..
Stanley 8-Inch Long Nose Pliers feature long-tempered jaws for working in hard-to-reach areas and forged-steel construction for durability. 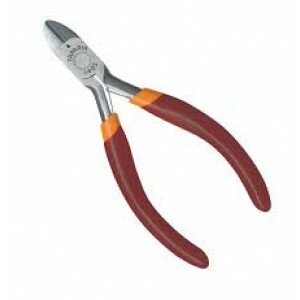 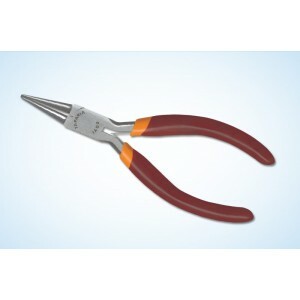 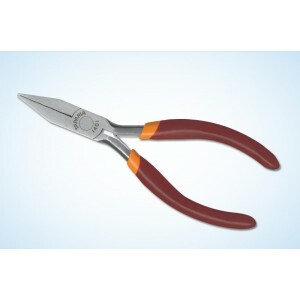 A rust-resistant finish protects the pliers from the elements and keeps them looking fresh after a hard day's..
Taparia 1401 Flat Nose Mini PlierDrop forged from suitable high grade steel and scientifically heat-treated.The pliers are fully polished.The cutting edges are precision machined to appropriate angle and also induction hardened for long life.The pli..
Taparia 1402 Round Nose Mini PlierDrop forged from suitable high grade steel and scientifically heat-treated.The pliers are fully polished.The cutting edges are precision machined to appropriate angle and also induction hardened for long life.The pl..
Taparia 1403 Long Nose Mini PlierDrop forged from suitable high grade steel and scientifically heat-treated.The pliers are fully polished.The cutting edges are precision machined to appropriate angle and also induction hardened for long life.The plie..